Around 80 junior-form students from 3 secondary schools in Yingde, Qingyuan, paid a visit to our School. Apart from the introduction of the local secondary education system and the features of our School, we also allowed the students to experience e-Learning with the use of tablet computers apart from arranging a school tour for them. The visitors were impressed by the development of our School. We welcome our new S1 members and their parents by providing them with information about the school policy and school regulations as well as reminders for both parties on how to better prepare for and adapt to the new life. The achievements of students taking various art and music interest classes were also demonstrated to the participants for a glimpse of school life. This is the last assembly of the school year. In his speech, the Principal urged the students to review their performance in the school year so as to strengthen their strong areas and improve their weaknesses. The assembly was followed by the Graduation Day. S6 graduates went up to the stage to take photos with the Principal and their teachers, signifying the completion of their secondary school education and memorializing this big life change. Around 50 students of senior and junior forms entering the final grabbed the chance to display their vocal talents. The contestants were asked by Music Association to wear costumes and masks during the concert, and created much more excitement to the audience. Besides singing, some contestants performed their songs with rock band instruments and pop dances. Everyone was overwhelmed with the extraordinary performances! The show was concluded by a performance of an indie band called “Empty”. The band members rocked the school hall with the students. The annual singing contest was ended with a big round of applause. This year the historical figures chosen for the Competition were Napoleon Bonaparte (S2), Emperor Xuan Zong of the Tang Dynasty (S3) and Dr. Sun Yat Sen (S4). The preliminary of the Competition was held during April and May 2017. This year four classes were chosen to enter the Final of the Competition, which was held during the post-exam period on 4th July 2017. The champion was 4C. The audience was impressed by not only the props and costumes of the classes but also their devoted acting. In his speech at the beginning of the assembly, the Principal brought out the importance of commitment through a story. 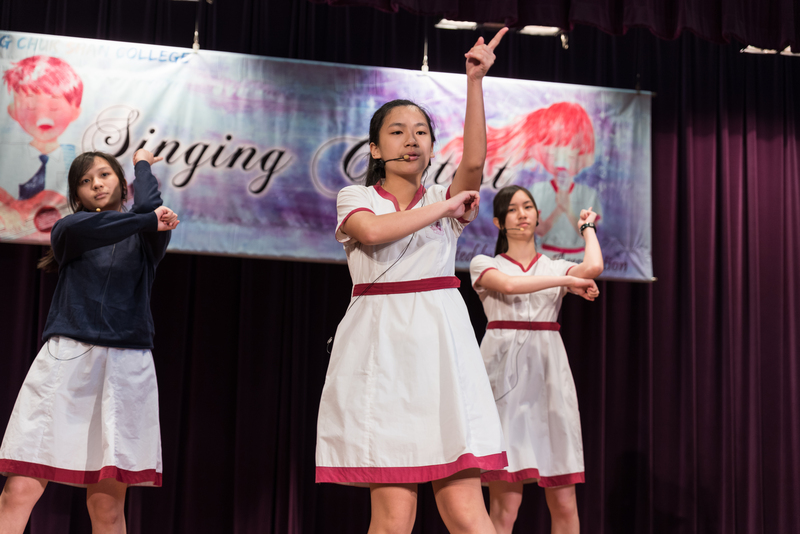 After that, the winners in the Instrumental Competitions, Verse Speaking and Public Speaking organized by the Hong Kong Schools Music and Speech Association performed their winning pieces. The performances were interleaved by a Junior English debate demonstration. Next, some participants of the Hong Kong Young Ambassador Scheme shared their experience in the service programs they had joined. The assembly ended with a demonstration of the joyful exercise, which is an activity promoted by Joyful Jockey Club Love to Move Program aiming at enhancing students’ emotional well-being. Eighteen S4 students studied the demography, allocation of community resources and quality of life in Sham Shui Po under the guidance of social workers from YWCA. They also carried out in-depth investigation into the life of scavengers and the homeless through visits and community services. The students also drafted innovative plans to provide effective assistance to the poor in Sham Shui Po, which would be actualized by YWCA. The assembly started with the Principal’s speech. In the speech, the Principal urged students to develop a proper attitude when dealing with difficulties. The speech was followed by a careers talk delivered by an alumnus, Mr. Delon Lim, a 2006 S7 graduate. 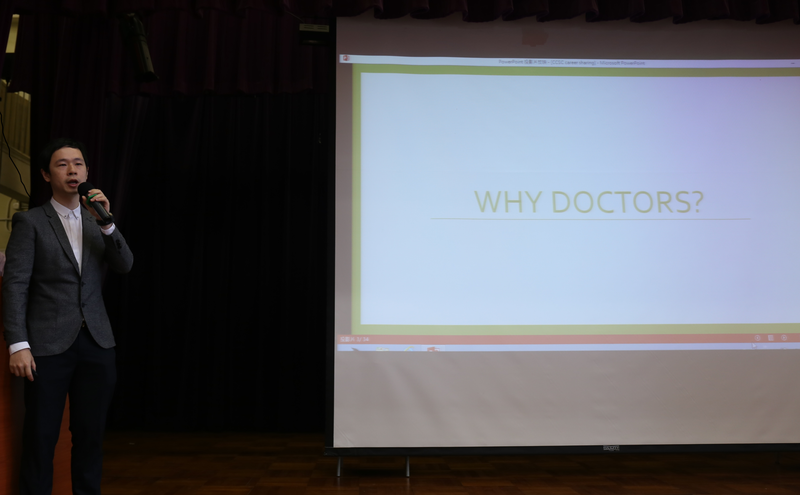 In his talk, he explained the prerequisites for becoming a doctor besides sharing his experience as a doctor. The assembly ended with another talk, in which the founder of Hong Kong Homeless Dog Shelter, Miss Angela Chan, shared her experience on rescuing stray dogs. To mark the end of the interschool Chinese Debate Invitational Tournament hosted by our school, a demonstration match with mixed team members from the 5 participating schools was held right after the Principal’s speech and prize presentation. Then our Geography and Conservancy Society promoted environmental awareness through an amusing self-produced video. Former Director of Hong Kong Observatory Mr. Lam Chiu Ying gave an inspiring talk to S5 students on the topic “sustainable development”. With his ample knowledge about and experience in the topic, he led students to relate unsustainable lifestyle to values predominant in the contemporary world (e.g. materialism). Lam also provided a philosophical and spiritual touch on ways that we can help decelerate further damage to the nature. This annual thrill organized by the Art Club attracted a large audience again. The theme this year was Flavors of Life. 9 groups presented their designs on stage. Our exchange student and other models wearing the unique costumes walked confidently on the T-shaped runway during the performance. Each design showed the creativity of our students echoing the theme. There were 4 prizes for this event: Overall Champion, 1st runner-up, 2nd runner-up and the Most Popular Award, which was received by the group that obtained the largest number of votes from the audience. A talk was co-organized by the PTA and Careers Team to inform S3 students and their parents of the S4 subject groups in the coming academic year as well as administrative procedures involved in subject group allocation. Moreover, a talk on how parents could facilitate their children’s life planning was also given.